It’s a little weird that one of the best musclecars you can buy happens to be a truck. But there’s just no getting around it: Chevy’s 390-hp SSR “super sport” retractable hardtop pickup is closest in configuration (beefy full-frame chassis, huge 6.0-liter V-8 engine, rear-wheel drive) road feel (heavy; brutally powerful) and sheer outrageousness to a ’60s-era big-block mauler of any new vehicle available today. That’s not how Chevy markets the ’40s-themed, retro-styled SSR, of course, but take a turn behind the wheel and see for yourself. Under the hood lies a blunderbuss of an engine, massive and gleefully overpowered with nearly 400 easy horsepower on tap and so much torque (405 lb-ft) that heroic power slides from the curb and tire-barking 1-2 upshifts as you screech out of the Mickey Dee’s parking lot are as easy as stomping on the gas pedal. Even with humungous 20-inch rear wheels and 40-Series Goodyear tires — eons removed from an original muscle car’s tenuous F60 bias-plys on 14-inch steelies —it’s still a simple matter of putting your left foot on the brake for just a moment while simultaneously standing on the accelerator and holding the engine against the converter, letting the revs build. In a moment, the huge V-8 overpowers the brakes, the tires break loose, and off you go in an eye-watering haze of blue-white smoke and smoldering rubber. But once the needle slips past 100, the SSR begins to feel more like the full-frame muscle cars of the past than a billet aluminum and hydroformed ’Vette — a machine that’s as smooth as Billy Dee Williams, even at 130-plus. The SSR will also go very fast, if you dare — but it’s not really happy in the land of triple digits, at least not beyond quick blasts on straight roads with lots visibility and plenty of time to drop the ’chutes and haul her down. There’s a fair amount of drift at speed, and you need a firm hand on the wheel to keep it tracking straight — again very much like a classic-era muscle car. All that weight, the body-on-frame construction, and a profile that’s not exactly wind-cheating render the SSR better suited to furious blasts from stoplight to stoplight than top-end hauling. But the big lug stops with confidence thanks to high-capacity disc brakes all around and actually handles reasonably well unless you get mental and forget you are driving a truck — heavily modified for sure, but still, essentially, a truck — with as much dead weight to lop around the corners as a full-size SUV. Still, the SSR’s passing gear prowess is not to be missed and it’s hard to surpass. Kick it down to second, then wind the LS2 V-8 (more or less the same engine used in the ’05 Corvette) to the edge of the electronic fuel cutoff just past 6500 rpm. You’ll slingshot forward like an old Biscayne with a JATO rocket bolted to the roof. Also amusing: The “torque-o-meter” in the secondary gauge cluster mounted on the console just ahead of the shifter. It reads from zero to 400 lb-ft to let you know just exactly how much twist is being put to the pavement at any given moment. It’s handy in terms of letting you rev the engine to its precise torque peak of 4400 rpm before dumping the clutch (six-speed models) or holeshotting the converter (automatics) for the quickest 0-60 and 1/4-mile ETs. Not cheap, but what power is? At $42,430 the SSR is not cheap fun like most of the old muscle cars were back in the day. But on the upside, there is absolutely nothing like it on the road at any price. It has a show-car body that draws more stares than a jackknifed semi and the retractable hardtop is both cool just to open and close in front of a crowd as well as snug and tight in the winter time in a way that no soft-top convertible can ever hope to be. In addition, the SSR has a surprisingly useable 23-cubic-foot bed that will accommodate a full load of luggage, stuff you might pick up at a swap meet, several bags of groceries, whatever. In this respect the SSR is vastly superior to other radical, limited-production factory customs like the old Plymouth Prowler, which had next to no storage space and was about as viable on a long trip as a black-lung coal miner in the New York Marathon. Though not available with four-wheel drive, the SSR will also pull up to 2500 lb, so a mini-trailer and a couple of dirt bikes is not out of the question. Pretty much everything is already included in the SSR’s base price. And this year you can choose either the four-speed automatic or the newly available heavy-duty Tremec six-speed manual at no extra charge either way. If you pick the manual, you’ll also get a heavier-duty 9.5-inch axle (automatic-equipped SSRs use an 8.6-inch Zexel-Torsen axle). Both are fitted with 3.73 gears and limited slip. Chrome wheels will cost you another $1500; the auxiliary console-mounted gauge package (with the “torque-o-meter”) is another $400. You can also order a cosmetic engine cover for the 6.0-liter V-8 as part of an equipment group that also includes heated driver and passenger seats, Bose premium audio, Homelink electronic transmsitter, and electrochromic auto-dimming mirrors for another $1900. Even with all that, it’s still less than a ’Vette — and draws far more attention. The right kind, too. People like the SSR and think it’s neat. Corvettes are wonderful cars but they suffer from “male enhancement” stigma that dates back to the ’70s and still, unfortunately, exists today. That’s not an issue with the SSR. Men love it and women don’t hate it, which is important to any married guy thinking about buying one. Chevy may have created the perfect latter-day muscle car — even if it happens to be a truck. Best of both worlds. Sounds like a vette, looks like a old classic pickup but stylish. Hard top & convertible awesome. Roadster, truck, performance. What else can you ask for. Stop you in your tracks appeal. 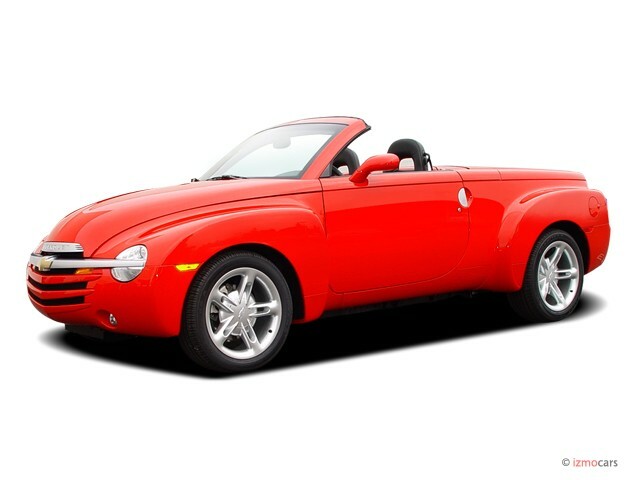 Looking for a different year of the Chevrolet SSR?